Bitcoin Mercantile Exchange, or BitMEX, is a trading platform created by a selection of finance, trading, and web-development experts. Arthur Hayes, Ben Delo, and Samuel Reed launched the exchange in 2014 under their company HDR (Hayes, Delo, Reed) Global Trading Ltd.
BitMEX offers a margin-trading service for experienced, professional Bitcoin traders. Up to 100x leverage is available to users for Bitcoin and a selection of altcoins for spot and futures markets. 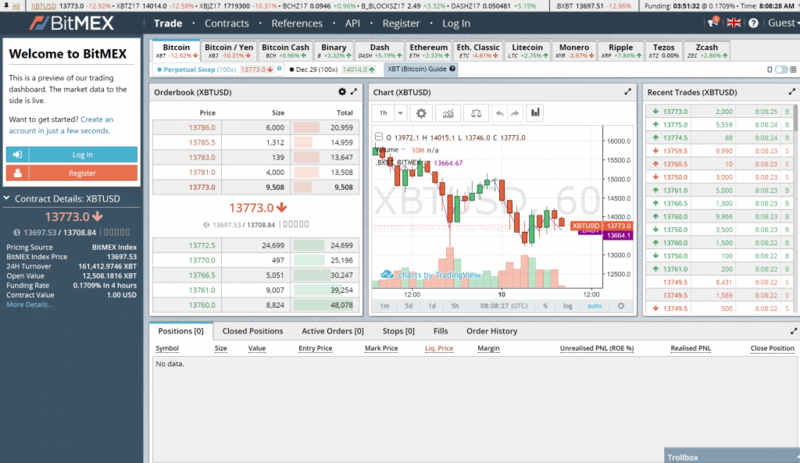 In this review, we’ll look at the features BitMEX has on offer, its operating methods, and ultimately whether the exchange suits your needs. Bitcoin trades have both spot and futures trading options, while all other currencies have only futures markets. Currently, there is no support for fiat currency, and the exchange only handles Bitcoin; this means that profits and losses are shown in Bitcoin even when you’re working with altcoin contracts. When you choose your trading platform, it’s important to take this into account. The liquidity of altcoins isn’t always reliable, and you’ll need to make deposits and withdrawals in Bitcoin. BitMEX itself is a registered company in the Republic of Seychelles, but as with most Bitcoin operations, it’s a worldwide service. The exchange doesn’t limit access for any locations thanks to the cryptocurrency nature of the site. Local laws may affect your use of the service, but this is out of the company’s control. The exchange’s trading volumes really do reflect its worldwide use. It regularly sits comfortably in the top five on Coinmarketcap, with upward of $2 billion Bitcoin trade volumes in a 24-hour period. Fees are very competitive on BitMEX. In fact, most users will find them almost negligible relative to the chunky profits to be made if you’re a savvy operator. The taker fee is set at 0.0750%, and the maker fee can be -0.0250%, so the marker actually grabs a little rebate on trades. Check out the full fee listings here. Deposits and withdrawals continue to be free of charge, which is always very pleasing—you shouldn’t be left with any hidden costs once you’re done trading (other than the Bitcoin network fees). 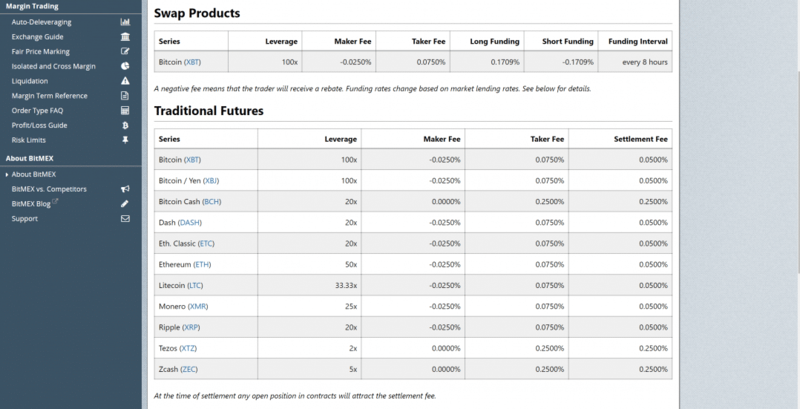 Overall, the fees make for an appealing read on BitMEX, especially compared to other major exchanges, where fees usually sit at around 0.25%. Generally, it seems like the BitMEX team try to cater to the expanding market and attempt to take the pressure off their customer service. Support is offered via an email ticket, which is pretty standard for the industry. The really nice aspect of the service is the website, which is packed full of useful information and features. The support center gives a slick rundown of the exchange and helps to educate users on complex trades. A live chat between traders also ticks along in the bottom right of the screen. While this may not be a direct line to BitMEX, it’s still really cool to be able to interact with other Bitcoin traders from within the exchange—plus, it’s known as the trollbox. Security information is loaded into the website, which is always a must for me when I’m looking at a new exchange. With BitMEX, you can quickly find out who owns the platform and how they’re keeping funds secure. Multisig withdrawals that only partners can sign, cold storage, and Amazon Web Services are the highlights when it comes to security. No deluge of public reviews exists for BitMEX. There isn’t too much to read on the big review sites like Trustpilot, probably because the technicality of margin trading isn’t widely understood by the general public. No horror stories have offered themselves despite a decent hunt. Reddit and similar forums tend to be more filled with technical questions and chatter. In my mind, this presents a positive sign for the trading exchange, as we all know bad reviews usually spread like wildfire. Conclusion: Is BitMEX a Good Exchange? If you know what you’re doing and want a market-leading cryptocurrency derivatives trading platform, then BitMEX will be a happy choice for you. For those looking for a more simple exchange to buy and sell some Bitcoin, I suggest you look into some other more user-friendly options. 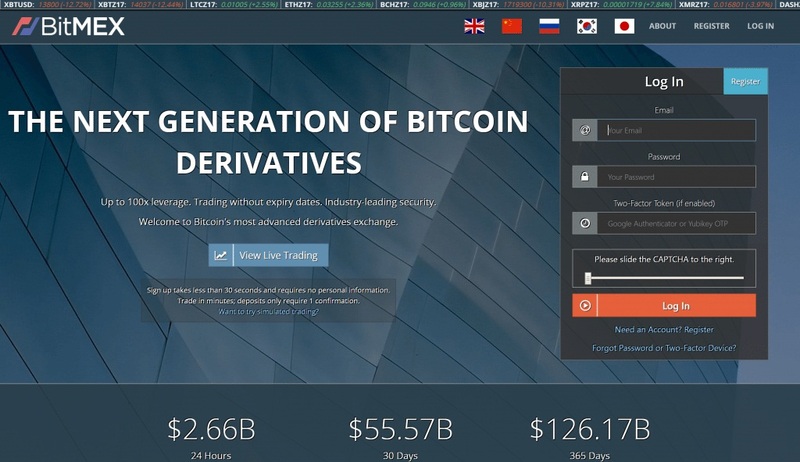 The BitMEX team use their financial and web-development experience to create a slick platform that allows smooth trading while keeping users informed. Live update features, such as the announcement tab and the live chat function, provide that little extra bonus in making sure you never miss out on crucial news. The fees round things off to make the exchange an attractive all-around package.